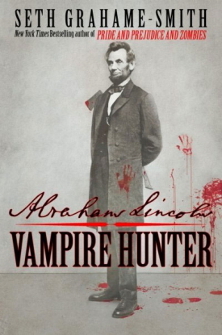 When I first heard of the concept behind both the book and film Abraham Lincoln: Vampire Hunter I was exhilarated. 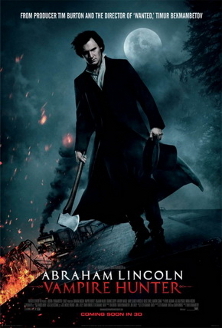 I’ve read enough dry, historical texts to appreciate the levity of reconsidering Lincoln’s life through the lens of him splitting vampires in half with his axe (instead of rails). What quickly happened as I read the book this past week was the dampening of my enthusiasm by my critique of the text (and later, film), but also the realization that I brought my own literary arrogance to the experience. What followed were existential questions: Can someone who spends so much time on critique, both of other’s and of one’s own work, ever enjoy art without the encumbrance of critique? I purchased the novel on on a whim to pass the time on my flight. The book itself begins with a prologue about a depressed, former writer running a general store who strikes up an acquaintance with a strange individual who is, unsurprisingly, a vampire. The vampire then bestows upon him the secret journals of Abraham Lincoln with the request that he take the information and compose a text based on the source material. The conceit is then dropped, as we are given the text that he supposedly authored and the prologue protagonist is never mentioned again. I had numerous problems with the text as I was reading. It approaches the material from the perspective of a third-person narrator/journal curator, frequently delving into passages quoted from the secret journals. The function of the narrator seems to be to fill in historical gaps and deal with the problematic nature of scenery and character description (which is still remarkably scant) among other narrative necessities that are not typical fare for the diarist. I found myself irritated with the nuances of the presentation, such as the way in which Grahame-Smith attempts to mimic the errors that would have been endemic to an 18th century, autodidact country boy. They are too few to be believed, and later in the presentation of the journal passages they are completely missing. Under the assumption that errors are part and parcel with all writing, and considered in the context of the fictional conceit from the prologue, the narrator, at some point, has elected to edit the journals, and thus becomes Lincoln’s editor for posterity’s sake. To make it simpler, the whole matter could have been completely dispensed with. Characters are introduced to plug up hole after hole in the plot (need bodyguards? here’s three nameless, descriptionless vampires), create foolish historical intrigue (e.g. a friendship between Edgar Allen Poe and Lincoln), and are tossed away just as easily (one of the early main characters gets killed by a horse and Lincoln hears of it second hand). Manipulating the history is by far the greatest opportunity to make inroads in the artistic fulfillment of this piece, but it is handled with mixed results. In some cases, major historical events are cleverly weaved into the vampire narrative. Equally important is the counterbalancing, as this is a conspiracy text and the events must have a clever reason to be concealed or overlooked by history in order for the conspiracy angle to fly. A great example of this is the death of Stephen Douglas, Lincoln’s rival in politics and love, and the way in which his death is both related to his late-in-life change from pro-slavery (and, by association pro-vampire) leanings to repentance and abolitionism. In some cases, crutches are used to keep the concept going. Referencing the earlier point about dispatching characters, Lincoln’s life is one marred by death and working out how to relate those deaths to vampires would seem to be a challenge, but it wasn’t for Grahame-Smith: most anyone who died in Lincoln’s life did so because a vampire poisoned him or her with vampire blood. It’s a convenient trick, but each successive use of this concept serves to play out the concept a little bit more. It seems, as the novel wears on, that the temptation of this juicy concept is too much for Grahame-Smith to rein in. Slavery becomes the enterprise of vampires. The civil war becomes a conflict between “good” vampires and “evil” vampires with humans as their pawns. Every subsequent problem of race relations in this country: vampires. It borders at times on an apologist history of the United States, where every supposed bad thing that we did as a country was somehow directly linked back to vampires. In a more reflective piece, one might be able to link the fictional scourge of vampires to our own real-life complicity in morally objectionable activities through the metaphor of vampires as a projection of our own shame-fractured psyches: “we couldn’t have done such things, so it must have been vampires.” That simply doesn’t happen however, and the ending of the text comes off as pointedly hackneyed as the constant, obvious references to Shakespeare’s five most widely read plays (I won’t spoil the ending if you still plan to read the book). With all of those criticisms in mind, and as irritated as I sometimes was with the book, I still loved the concept. Portions of the book showed enormous potential. In fact, if the book had just been stopped right before Lincoln’s first trip to congress, it would have been all the better for it. Still, I wanted to see the film just to get an idea of how it could be translated into a compelling narrative. I couldn’t have been more disappointed with this film. It takes only the broadest strokes of the concept and translates them into a ham-fisted action vehicle fit for Sylvester Stallone. There is zero acting talent, and most of the compelling characters are reworked into standard action hero cliches or, worse yet, copies of characters from other films (Lincoln’s vampire mentor Henry Sturges not only has his compelling backstory flattened and distorted, but his character appears to be a dime store knockoff of Robert Downey Jr.’s Sherlock Holmes). Every ounce of history is all but obliterated from this film, with the apparent hope that people have at least heard of the Civil War and can make the connection that slavery = vampires = bad. It is pandering of the worst degree, making little to no effort to engage anything that made the book mildly entertaining. If you knew nothing of Lincoln the man going in, you know less coming out, which is a pitiable shame. Where the novel has lofty ambitions yet fails in many of the supporting details, I can say that the film appears to have no ambitions and fails at even producing a coherent action story, which is by far the worse sin. What’s disturbing to me is that neither book nor film are inherently bad, they just have certain faults that I don’t like. As the years go by, I find that list of annoyances growing and growing as I consume more and more, to the point where I rarely see something that doesn’t disappoint in one way or another. There are rare exceptions of course, but it leads me to question the soul-crushing nature of a life of criticism. In the academy the trend is the same: we are all trained as skeptics and debunkers first, and that seems to persist (and intensify) to the point that some professors I meet can’t listen longer than twenty seconds before they start in on the problems with your study. In some cases, you either never get to explain your results or they fall on deaf ears, as you have some component of your study which causes a fatal hangup from the audience member who will never appreciate the contributions you do make. As instructors, we search relentlessly for problems with student writing. I myself rarely issue perfect grades on assignments. Part of the process of learning is continual improvement, such that we feel the need to constantly critique in order to force students to improve. We play “devil’s advocate” in the classroom, countering students’ assertions to force them to think through problems. And we complete the cycle, forcing students into the critical mindset we espouse. Criticism is not bad. In the anticipatory sense, it forces us to perform necessary self-edits and to exert a higher level of effort, ultimately resulting in more polished, mastered work. In the post-writing sense, it forces us to detach from our work and reflect on how we can improve. As it relates to aesthetic appreciation, it helps us define our tastes and collectively promote those works that reflect our own interests. If there are lessons to be learned from the above experience, perhaps they center on appreciating something for what it is, not what it could be. As much fault as you find with one incarnation of a project, it could always be worse. That sounds like a dismal or glib conclusion, but it seems to be one that is overlooked, especially in our culture. A recent Pew study on Twitter and political opinions found that people were decidedly more negative in their sentiments when using Twitter versus reaction to the same events gathered through phone surveys. Laughably, I went on Twitter to criticize Pew’s lack of disclosure concerning methods after I read the report. If true, and if others feel the same way as I did about the study, it potentially reveals a doubly sad truth about the internet: we can’t help criticizing everything, and at the same time we can’t stand to accept that we are overly critical.